Spring is finally here and I am loving our sunshine. We had a water filled winter (which I’m grateful for considering the drought we’ve had for the last several years). And now everything is turning green as it warms up a bit. I love this time of year as the lilac bush fills the air with its delicate fragrance and the garden starts sprouting. These kinds of days make me want to abandon the housework and spend the day outside working the garden and yards. Of course, one can’t completely avoid meals. I know, such a bummer, right? Quick and easy meals are a must on days like today. 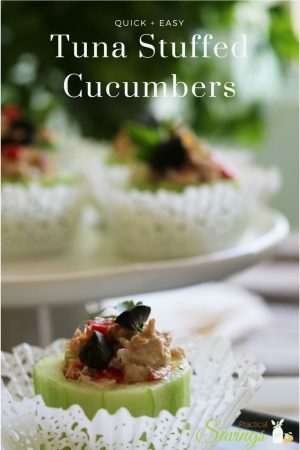 I don’t want to be stuck in the kitchen cooking dinner for 2+ hours so planning ahead and having something like these quick and easy Tuna Stuffed Cucumbers on hand makes for a nice light dinner. 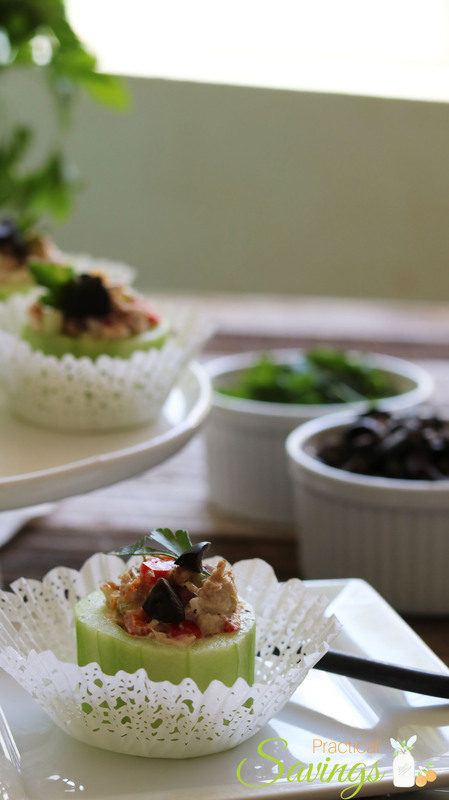 Pair them with a side dish of quinoa and a green salad or one of your favorite side dishes and you’re good to go for dinner. 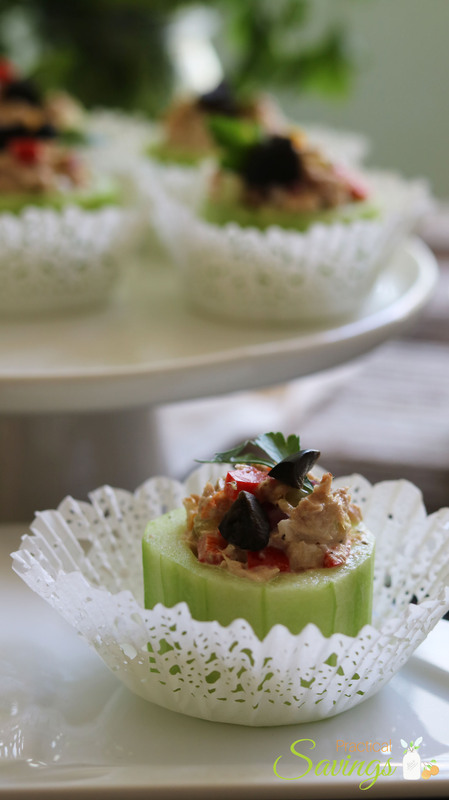 Or, you can use these for a light appetizer at a garden party. 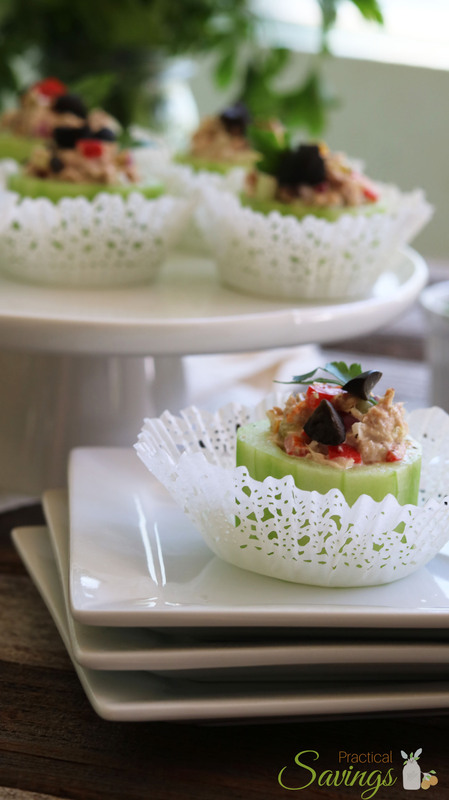 … dress them up with delicate cupcake paper liners for a party. 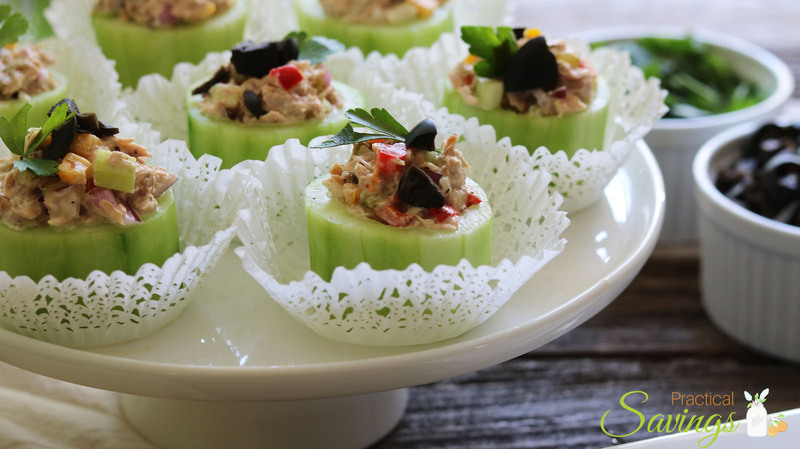 They’re sure to be a hit wherever tuna and cucumbers are loved. 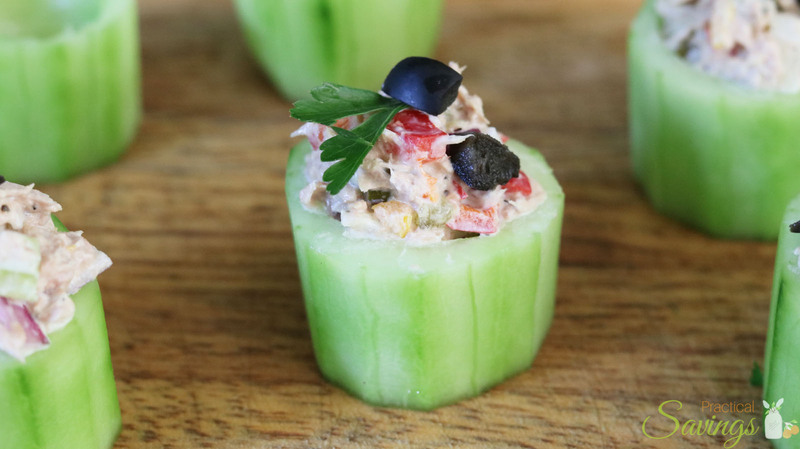 So whether you need a quick and easy meal for dinner after a long day working in the yard or you need a quick and easy appetizer for a party, these simple tuna stuffed cucumbers will fit the bill. 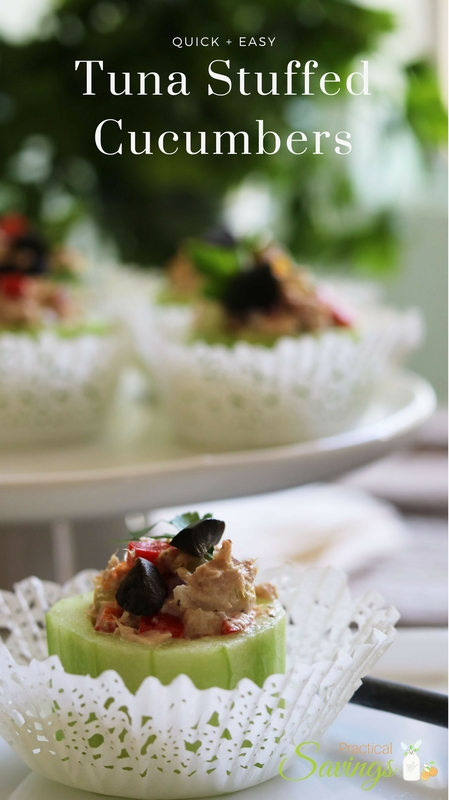 I recommend that if you want to make this recipe ahead of time, you just make the tuna portion and refrigerate until ready to use. 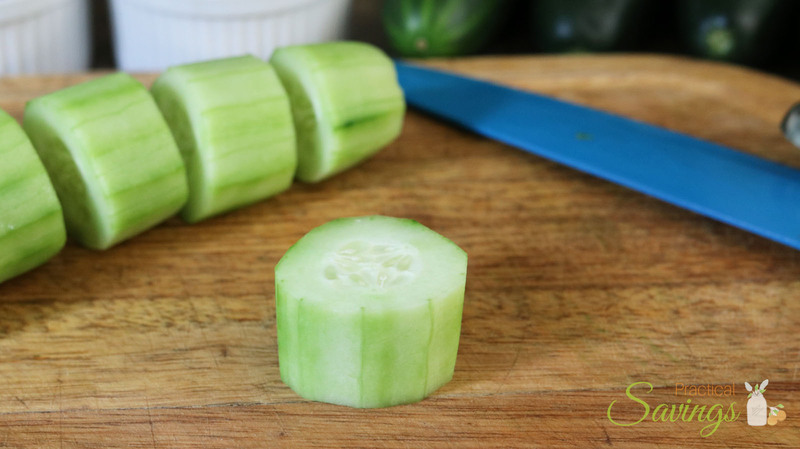 Cucumbers can become soft after they’re cut and peeled so wait until the day of serving, if you can, before peeling and cutting those. Chill until ready to serve and refrigerate leftovers for up to a couple days after. They won’t be as fresh but still edible. Drain tuna and empty cans into a medium bowl. 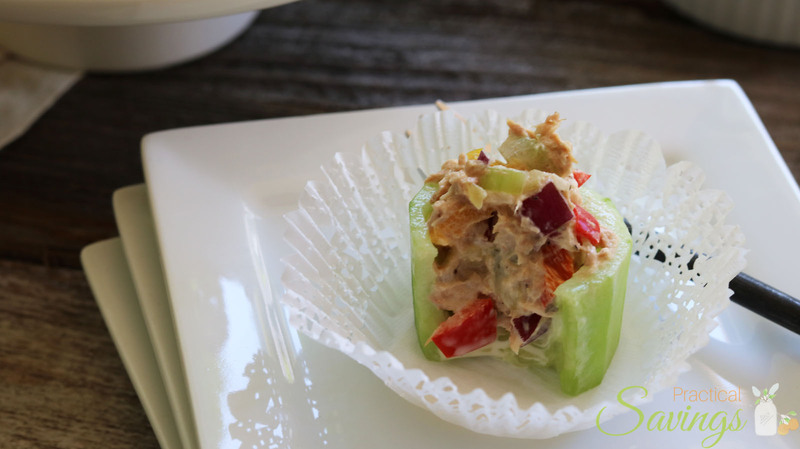 Dice celery, peppers, onion and pickles and add to tuna. Dice olives, setting aside half for garnishment. Stir in mayonnaise. Add salt and pepper to taste and chill in fridge until ready to use. 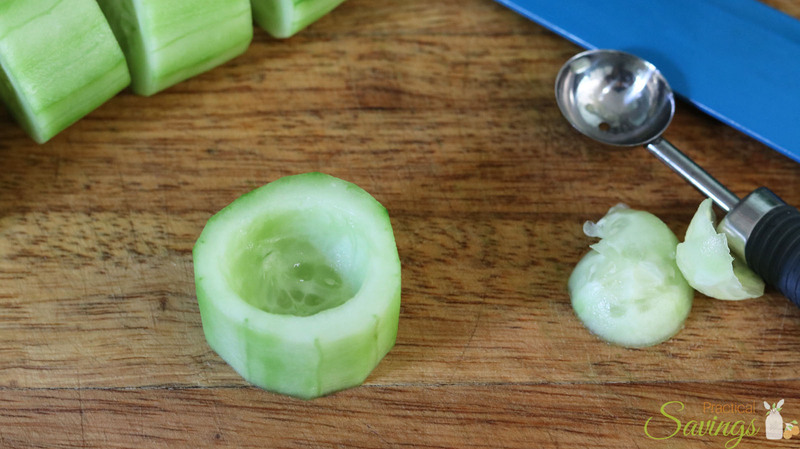 Wash, peel and slice cucumbers into about 1.5″ thick slices. 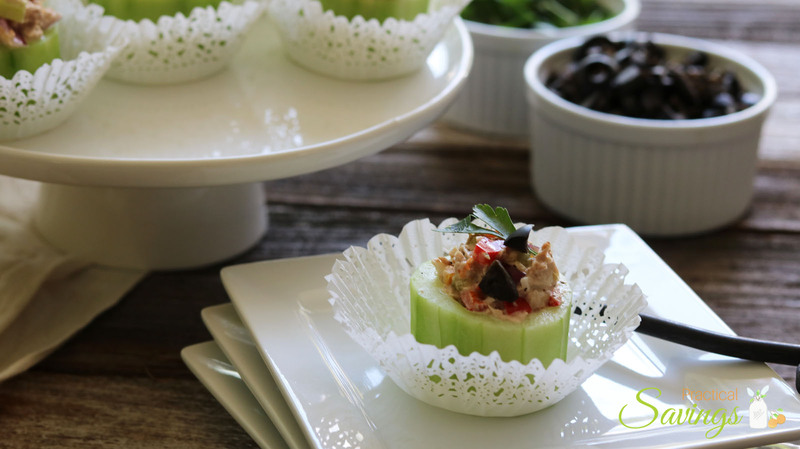 Using a melon baller or spoon, remove center seeds about 3/4 of the way down, leaving enough base to keep the tuna from falling out. Stuff the holes until overflowing. Top with remainder olives and fresh parsley leaves. Chill until ready to serve. Store leftovers in an airtight container for up to a couple days.